TOWN N COUNTRY LIVING AT BEST! 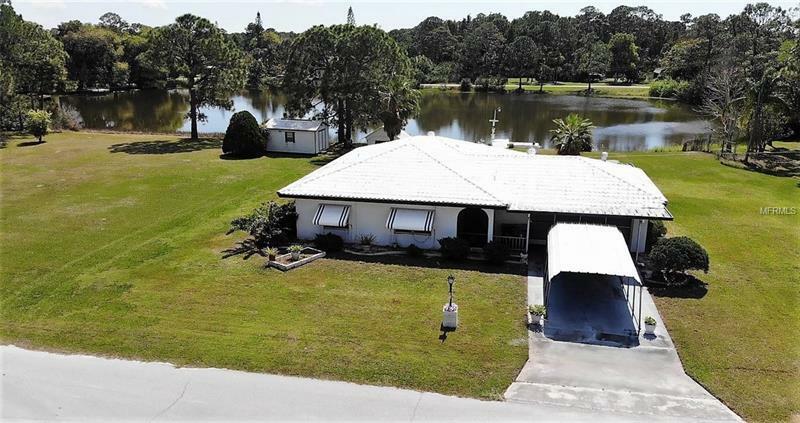 This private and rare property located on a Large Lake with THREE adjacent lots...just under 1 acre.....over 200 feet of LAKEFRONT. This is a Birdwatchers Paradise. Large Eat-in Kitchen with pass thru to one of the TWO FLORIDA Rooms. Both afford Panoramic views of the Lake perfect for LAKEFRONT dining, artist studio, den, extra bedroom or hide-a-way. Two Bedroom/Two Bath with open Livingroom/Dining. Relax on the Open Air Patio perfect for Sunbathing or Stargazing. Multiple Sheds provide plenty of room for the BOY TOYS or Workshop. Awnings drop down for window protection. Two car screened garage plus a carport. Did I mention the additional lots are buildable! Live in privacy and comfort in Florida's Natural Preserve Setting minutes from 175 and Downtown Entertainment District. This is a must see, one of a kind property. Call today!